PACKRAT PLANET, in association with THE GOLDEN AGE OF MUSIC VIDEO, is having a huge blowout event to celebrate the 25th anniversary of that summer phenomenon of 1988 — COCKTAIL the movie! The film that launched a thousand bottle tossing “flair” bartenders, gave the Beach Boys their last charting hit, featured Kelly Lynch in a Pocahontas bikini, established “Coughlin’s Law”, and made reciting a poem on top of the bar a cool thing to do. Subways: B-D-F at 42nd Street, 1,2,3,9, N, R, Q, L, S at Times Square. For one night only, Windfall becomes Flanagan’s Cocktails & Dreams! 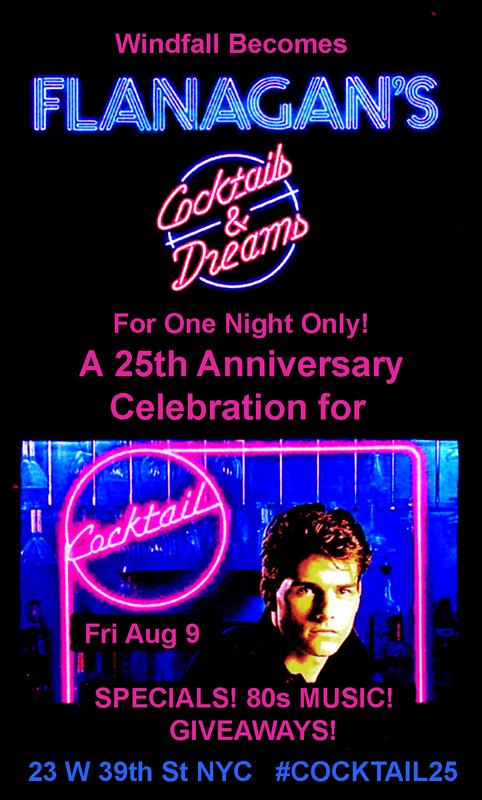 We’ll have the movie running silently on screens all night while the crowd enjoys DJ Packrat (early) and DLJ (10-2) spinning COCKTAIL soundtrack hits and 80s party classics! Free “Kokomo” leis for the first 50 guests! Bottle tossing bartender show starring Raymond “The Bartender Show” You! Poems from the film will be recited atop the bar! Special COCKTAIL-themed drinks, including the Cruise Bar Rum Punch, the Tourquoise Blue, and the Red Eye! Free “Hippy Hippy Shots” whenever you hear the Georgia Satellites COCKTAIL soundtrack hit”Hippy Hippy Shakes”!! 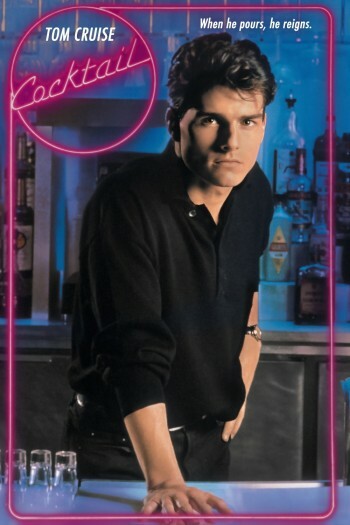 Tweet #Cocktail25 onsite to win 80s movies on DVD and Beach Boys’ Greatest Hits CDs! Don’t miss COCKTAIL stories from the shoot from Tom Cruise, Kelly Lynch, Lisa Banes, James Eckhouse and director Roger Donaldson!